Murray Raine grew up in Newcastle, New South Wales. His initial interest and love of puppetry was triggered at the early age of six. Following a performance by the iconic Marionette Theatre Of Australia at Waratah Infants school, he knew a career in puppetry was his destiny! 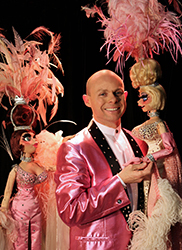 Now four decades later Murray is regarded as Australia's leading cabaret marionettist. Since 1985 he has extensively worked and toured in Australia's major theatres including principal roles for the Marionette Theatre Of Australia, Sydney Puppets, The Performing Puppet Company and The Jim Henson Company famous for The Muppets. Murray's vast career in puppetry has led to an outstanding body of work in theatre, film, night-clubs, cabaret rooms, television, major corporate functions, cruise ships, International arts festivals and television commercials as well as directing and lecturing in the art of puppetry. In 1988 he was chosen to study with the world-renowned Phillippe Genty Co of France. His numerous television credits include: Farscape, The Midday Show, Wonderworld, Ridgy Didge, FoxKids, Puppets Australia, The Andrew Denton Show and Good Morning Singapore just to name a few. The countless television commercials include the famous pasta family for Dolmio Pasta Sauces in Australia and the UK . From 1987 to 1989 he presented Australian Life Education Centre's Harold G.Raffe, the witty giraffe glove puppet for ATN 7's live morning Cartoon Connection show. Murray is perhaps most famous and regarded for his own amazing solo cabaret shows. His enormously popular family show It's Raining Puppets has enthralled audiences across Australia, Singapore, Thailand, Taiwan, the Philippines and such exotic ports as Dubai in the Middle East. A command performance for royalty at the palace of the United Emirates was a highlight and shows the high esteem in which this international artiste is held. In November 2014 saw the release of the critically acclaimed documentary DVD Murray Raine Is Highly Strung. An in depth biography directed by film maker Peter Oldham that spans Murray's vast career in puppetry and theatre. Apart from the demands of International arts festivals and headlining for major cruise lines including Royal Caribbean, P&O , Carnival and Star Cruises Murray is highly sought after for his exhilaratingly wicked adult cabaret It's Vegas On A String!. This revue features hilarious caricatures of Elvis, Dolly Parton, Pavarotti, Madonna, Shirley Bassey, Whitney Houston and Lady GaGa. This spectacular show has twice won him the prestigious Australian entertainment industries Mo Award for Australian Speciality Act Of The Year, he is the only puppeteer to have been the recipient of this honour.